A voltage regulator is designed to automatically maintain a constant voltage level. A voltage regulator may be a simple feed forward design or may include negative feedback control loops. It may use an electromechanical mechanism, or electronic components. Depending on the design, it may be used to regulate one or more AC or DC voltages. 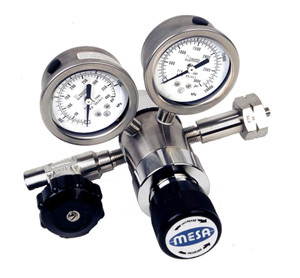 Gas pressure regulators are used to regulate gas pressure and are not used for measuring flow rates.Flow meters, Roto-meters or Mass Flow Controllers are used to accurately regulate gas flow rates. A diving regulator is a pressure regulator used in scuba or surface supplied diving equipment that reduces pressurized breathing gas to ambient pressure and delivers it to the diver. The gas may be air or one of a variety of specially blended breathing gases. The gas may be supplied from a cylinder worn by the diver (as in a scuba set) or via a hose from a compressor or a bank of cylinders on the surface (as in surface-supplied diving). A gas pressure regulator has one or more valves in series which reduce pressure from the source, and use the downstream pressure as feedback to control the delivered pressure, lowering the pressure at each stage. The terms "regulator" and "demand valve" are often used interchangeably, but a demand valve is the part of a regulator that delivers gas only while the diver is breathing in and reduces the gas pressure to ambient. In single hose regulators, the demand valve is part of the second stage, which is held in the diver's mouth by a mouthpiece. In double hose regulators the demand valve is part of the regulator attached to the cylinder.